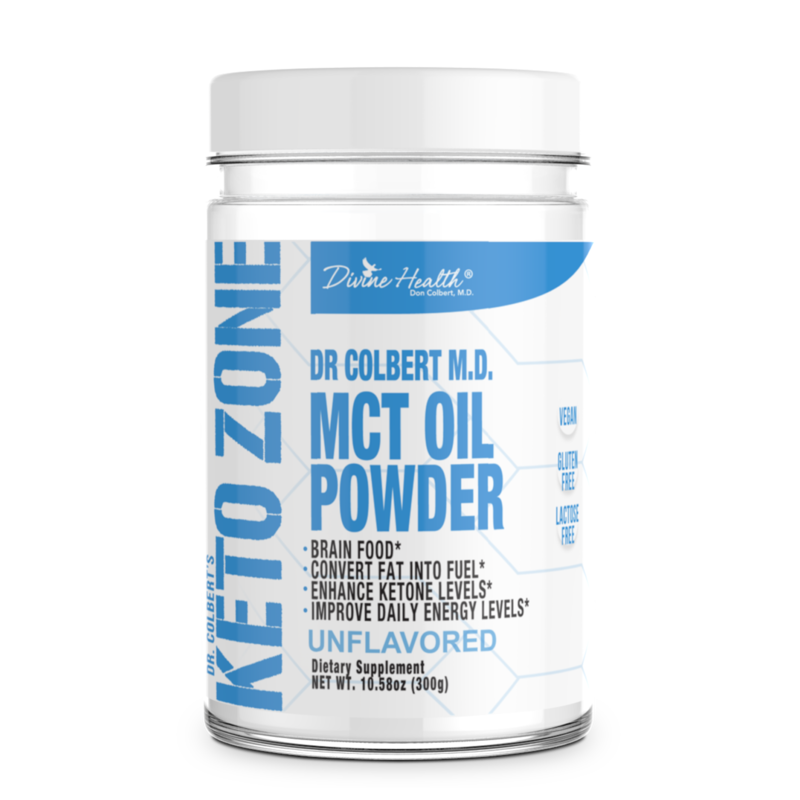 Keto Zone MCT Oil Powder (Unflavored) contains a smooth creamy flavor. It makes any glass of water or smoothie that much more tasty. This tasty powder contains NO artificial sweetners. The unflavor is derived from all natural extracts. The healthy fats in Divine Health’s MCT powder are quickly converted to ketones to provide increased focus, effortless energy, and enhanced Fat Burn. This low-carb and low glycemic fuel can suppress your appetite and keep you feeling full for hours.For the past decade experts have referred to MCT Oil as “Rocket Fuel” for your brain. MCTs are unique among fats since they don’t require bile salts for digestion or extra energy for absorption, use, or storage. Your brain cannot store energy and needs a constant stream of that energy which is usually supplied by blood glucose. Ketones is a great source of “Brain fuel” because it readily crosses the blood-brain barrier to provide instant energy to the brain.Clean Energy Source:MCT’s are medium-chain triglycerides, a form of saturated fatty acid that has numerous health benefits, ranging from boosting metabolism to providing a dose of energy throughout the day.MCT’s are typically found in Coconuts at a smaller percentage, however, Divine Health has extracted the MCT’s for a pure oil supplement for maximum benefit.MCT’s have been attributed to assisting in fat burning, aside from providing energy. MCT oil can help Increase satiety and even raise the metabolic rate by suppressing fat deposition through enhanced thermogenesis and fat oxidation. It does this by helping the liver produce ketones, an alternative fuel source compared to glucose..
DescriptionAre you a Keto Zone lover? Is there nothing you love more than being in Ketosis? Then this shirt is for you! 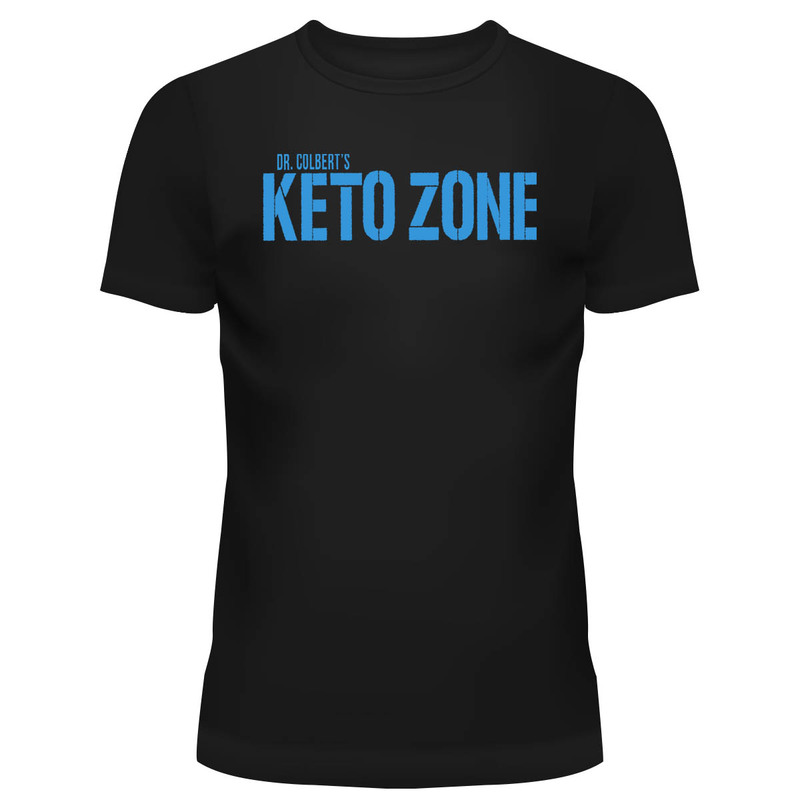 This super soft Black t-shirt, imprinted with a soft White matte, Available in 2 Different Colors for Both men and Women.Graphic tee designs are professionally printed, so that your unique design will look great..
DescriptionAre you a Keto Zone lover? Is there nothing you love more than being in Ketosis? Then this shirt is for you! This super soft Teal t-shirt, imprinted with a soft White matte, Available in 2 Different Colors for Both men and Women.Graphic tee designs are professionally printed, so that your unique design will look great..
20oz Shaker Bottle Flip Top Lid. Keto Zone MCT Oil Powder(Vanilla) contains a delicious and smooth french Vanilla flavor. It makes any glass of water or smoothie that much more tasty. This tasty powder contains NO artificial sweetners. The French Vanilla flavor is derived from all natural Vanilla extracts. The healthy fats in Divine Health’s MCT powder are quickly converted to ketones to provide increased focus, effortless energy, and enhanced Fat Burn. This low-carb and low glycemic fuel can suppress your appetite and keep you feeling full for hours.For the past decade experts have referred to MCT Oil as “Rocket Fuel” for your brain. MCTs are unique among fats since they don’t require bile salts for digestion or extra energy for absorption, use, or storage. Your brain cannot store energy and needs a constant stream of that energy which is usually supplied by blood glucose. Ketones is a great source of “Brain fuel” because it readily crosses the blood-brain barrier to provide instant energy to the brain.Clean Energy Source:MCT’s are medium-chain triglycerides, a form of saturated fatty acid that has numerous health benefits, ranging from boosting metabolism to providing a dose of energy throughout the day.MCT’s are typically found in Vanilla Beans at a smaller percentage, however, Divine Health has extracted the MCT’s for a pure oil supplement for maximum benefit.MCT’s have been attributed to assisting in fat burning, aside from providing energy. MCT oil can help Increase satiety and even raise the metabolic rate by suppressing fat deposition through enhanced thermogenesis and fat oxidation. 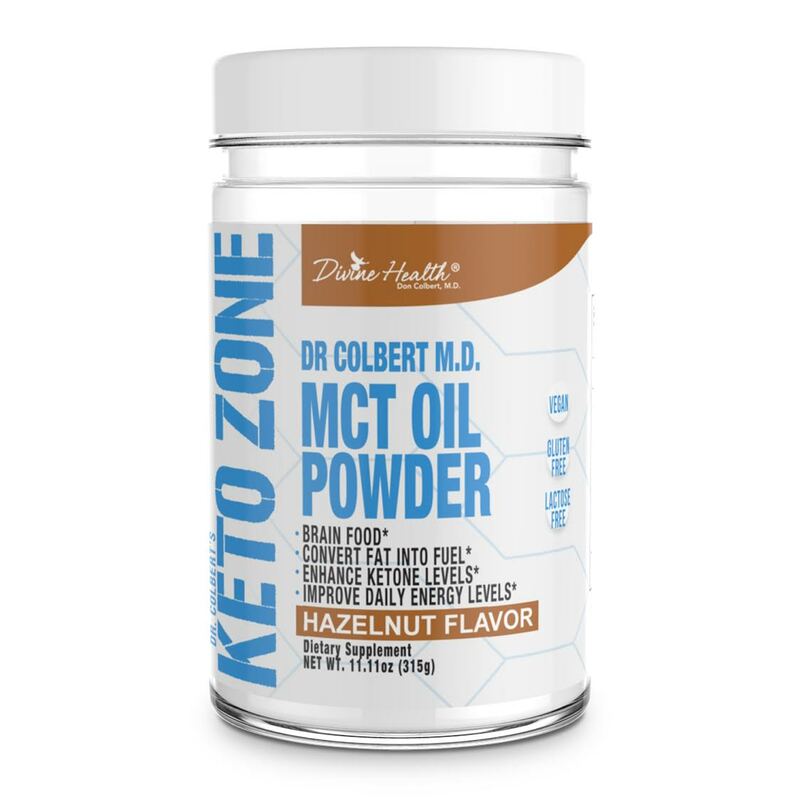 It does this by helping the liver produce ketones, an alternative fuel source compared to glucose..
Keto Zone MCT Oil Powder (Hazelnut) contains a delicious and smooth french Hazelnut flavor. It makes any glass of water or smoothie that much more tasty. This tasty powder contains NO artificial sweetners. The French Vanilla flavor is derived from all natural Hazelnut extracts. The healthy fats in Divine Health’s MCT powder are quickly converted to ketones to provide increased focus, effortless energy, and enhanced Fat Burn. This low-carb and low glycemic fuel can suppress your appetite and keep you feeling full for hours.For the past decade experts have referred to MCT Oil as “Rocket Fuel” for your brain. MCTs are unique among fats since they don’t require bile salts for digestion or extra energy for absorption, use, or storage. Your brain cannot store energy and needs a constant stream of that energy which is usually supplied by blood glucose. Ketones is a great source of “Brain fuel” because it readily crosses the blood-brain barrier to provide instant energy to the brain.Clean Energy Source:MCT’s are medium-chain triglycerides, a form of saturated fatty acid that has numerous health benefits, ranging from boosting metabolism to providing a dose of energy throughout the day.MCT’s are typically found in coconuts at a smaller percentage, however, Divine Health has extracted the MCT’s for a pure oil supplement for maximum benefit.MCT’s have been attributed to assisting in fat burning, aside from providing energy. MCT oil can help Increase satiety and even raise the metabolic rate by suppressing fat deposition through enhanced thermogenesis and fat oxidation. 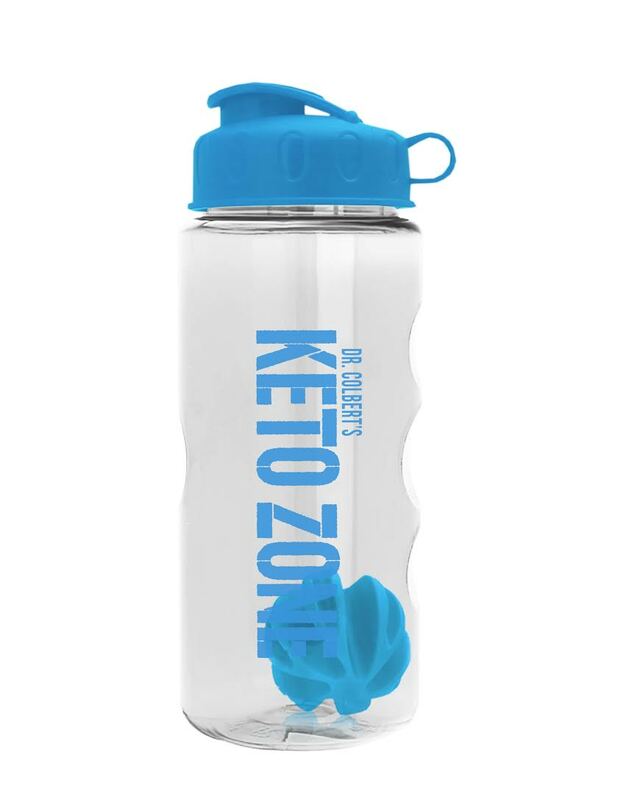 It does this by helping the liver produce ketones, an alternative fuel source compared to glucose..
Keto Zone Instant Ketones is designed to put your body in Ketosis, Instantly!The Keto Zone, otherwise known as nutritional ketosis, is the point at which your body is producing medium to moderate amounts of ketones. Ketosis is a metabolic state in which some of the body’s energy supply comes from ketone bodies in the blood, instead of the state of glycolysis in which blood glucose supplies most of the energy.Essentially, ketosis is a metabolic state in which you’re predominantly burning stored fat for fuel and converting fat into ketones to be used by the cells. The ketone bodies, acetone, acetoacetic acid, and beta-hydroxybutyric acid (BHB), are usually formed either when liver glycogen is low, or via metabolism of medium chain trigylcerides (MCTs). 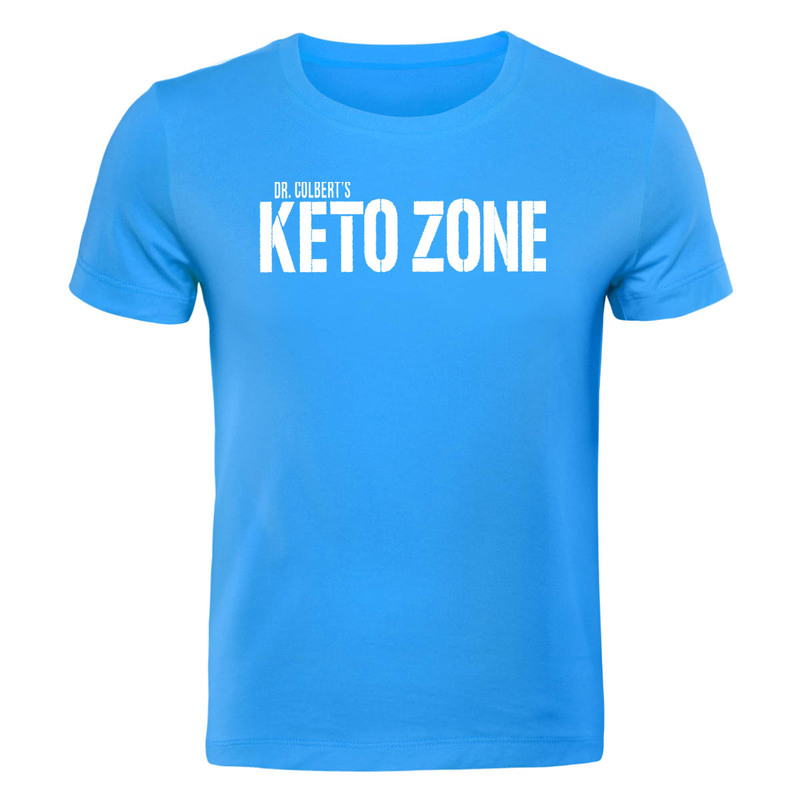 However, Keto Zone’s Instant Ketones enables the body to enter the Keto Zone by supplying it with an exodenous ketone called betahydroxy buturate (BHB).Do you want to know what the fastest and easiest way to enter the Keto Zone is?Entering the Keto Zone means you are burning fat for fuel instead of sugar. The benefits include Fat burn, increased energy, and mental clarity. These benefits are due to the body’s production of ketones in the absence of sugar. Unfortunately, it can take anywhere from 48-72 hours for most people to make the transition into the Keto Zone by avoiding sugar. Often this period is plagued with symptoms such as fatigue, irritability, and nausea. These symptoms are known as the “keto flu.” But how would you like to get the benefits of the Keto Zone without the unwanted side effects of the keto flu?Instant KetonesYou can enter the Keto Zone in less than one hour with Instant Ketones! This is is a new kind of ketogenic supplement that supplies the body with exogenous (externally sourced) ketones, as opposed to the endogenous (internally sourced) ketones normally produced by the liver. These ketone salts provide the body with a ketone called Beta-hydroxybutyrate (BHB) paired with mineral salt electrolytes of magnesium, calcium, and sodium. Burning fat in the Keto Zone increases the body’s utilization of minerals, this can lead to dehydration. Pairing BHB with electrolyte mineral salts helps to remineralize the body’s depleted electrolyte stores. Now you can avoid the symptoms of the keto flu as you make the transition to becoming a fat-burning machine.BHB salts can also be used after the adaptation phase to help the body get back in the Keto Zone after carbohydrate consumption. 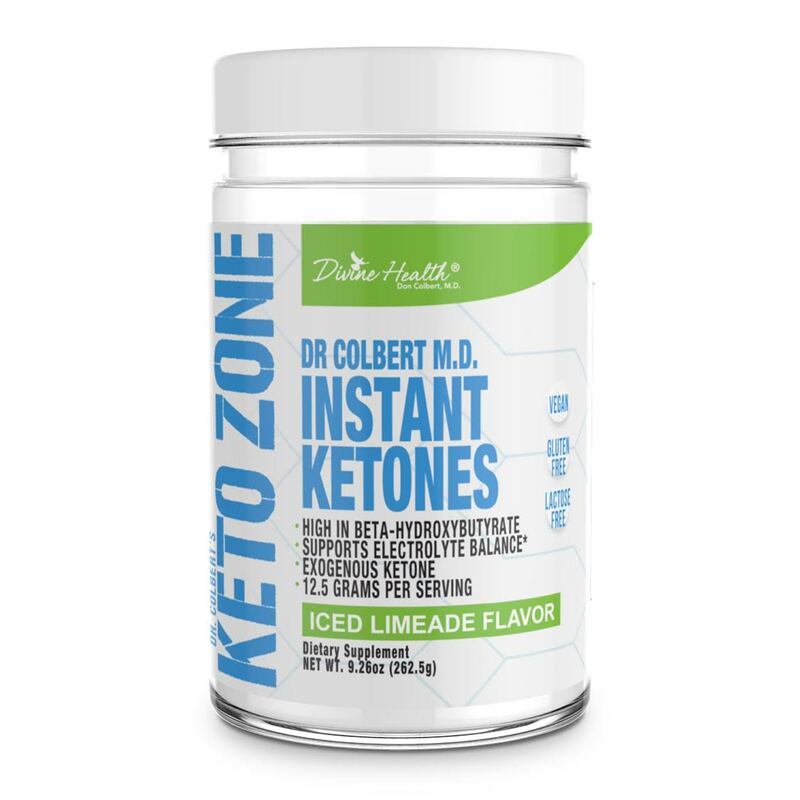 A strict ketogenic diet of less than 20 grams per day is still necessary to stay in the Keto Zone, but Instant Ketones can help you recover after the occasional slip-up! Instant Ketones provides quick and clean burning energy that can also enhance athletic performance for ketogenic athletes. Try one serving before a workout and you will feel strong, motivated, and energized for hours! Instant ketones also acts as an appetite suppressant allowing you to tackle your day without thinking food.Superior TasteMost BHB ketone supplements are hard to stomach. They usually taste something like jet fuel (and even that is being generous!) But this is not true for Instant Ketones. Divine Health has formulated the most delicious BHB supplement on the market. Our decadent Limade flavor allows you to get all the benefits of BHB without making you gag for minutes on end. Instant Ketones mixes easily with water, tea, coffee, nut milk, or your morning smoothie. With so many life-changing benefits why would you not try Instant Ketones today?Athletic PerformanceKetones offer an alternative fuel, especially beneficial for aerobic exerciseKetones are a higher octane, better quality fuelKetones can stall protein breakdown (catabolism)Improved fat oxidation equals enhanced metabolic rateAppetite ControlSupports healthy blood sugar and satietyAppetite control and a more efficient metabolism – you no longer need to snack every two hoursCraving control. There are 16 different types of collagen, but if you want healthy hair, skin, nails, and bones, there are two types that work best. Type I collagen is the most common form of collagen in the human body. Supplementing this collagen can have a dramatic effect on the health of the hair, skin, and nails. Ingestion of type I collagen can heal the skin by promoting density of collagen fibrils and fibroblasts, thus stimulating collagen production. 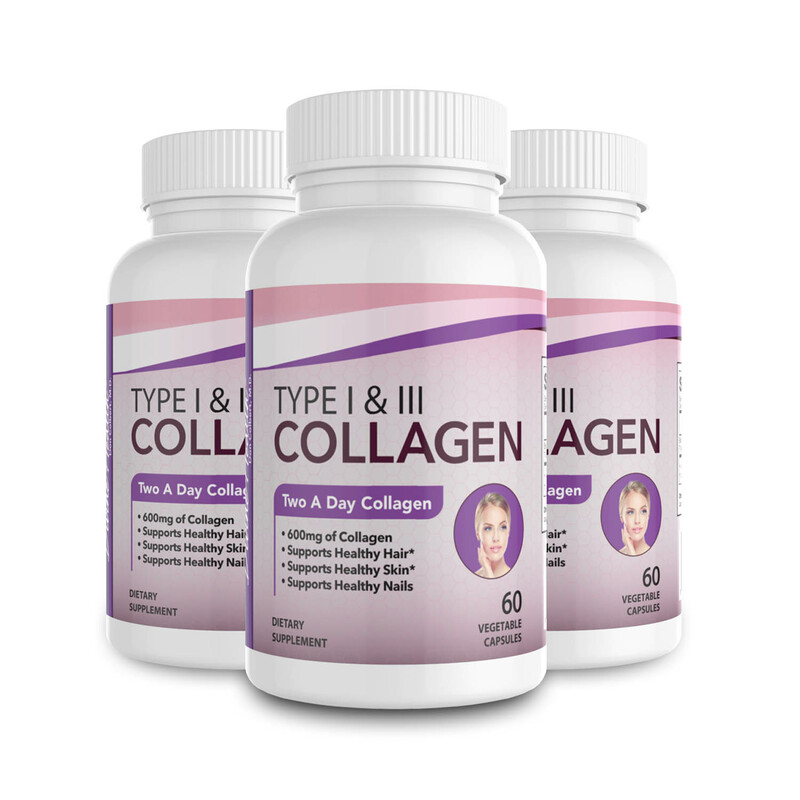 Type III collagen is the second most abundant collagen in the body. This type of collagen is also found in the skin and is responsible for its elasticity. Type III collagen is also a building block for the extracellular matrix the forms the structure of blood vessels and organs. Divine Health’s collagen capsules contain both type I and type II collagen to make sure your body has the building blocks necessary so you can look, feel, and perform your best!.